Carragreenan is an edible red seaweed. Sounds good, right? Many seaweeds contain lots of trace minerals and are very nutritious. “Carraigín” has been made from Irish Moss in kitchens for hundreds of years, to create the base for a pudding-like dessert. When cooked, carrageenan takes on a nice gelatinous texture. Today, it’s used to thicken and provide a smooth texture to paté-type (loaf) canned pet foods.. But industrially-produced carrageenan is far removed from its picturesque beginnings. Now, it’s a highly processed ingredient that is extracted using strong alkaline solvents. Food grade (also called “undegraded”) carrageenan is on the “GRAS” list (FDA’s list of items that are “Generally Recognized as Safe). As it pertains to pet food, the Association of American Feed Control Officials (AAFCO) defines it as an acceptable emulsifier, stablizer, and thickener. In addition to pet food, carrageenan is used hundreds of other products, from beer, ice cream, jelly, diet soda and yogurt to toothpaste, shampoo, and gel air fresheners. It can be found in many in vegetarian and vegan food products, where it is used instead of gelatin (which is derived from animals). Even organic foods can contain carrageenan. However, the European Union prohibits its use in infant formulas. There is another type of carrageenan called poligeenan (or “degraded” carrageenan) that has been broken down into smaller fragments. In science, it is used to purposely induce inflammation in animal experiments. Because it is known to cause cancer, poligeenan is not permitted in food. Carrageenan producers, as well as eterinary nutritionists and pet food manufacturers, assert that food-grade carrageenan is completely safe for pets to eat. The truth is not quite so simple. Even food-grade carrageenan is not perfectly pure; it contains “a low percentage” of the smaller, inflammatory, more damaging fragments. This may explain why even food-grade carrageenan has been known to cause problems. Researchers have discovered that carrageenan triggers the body to produce a cytokine (an intercellular messenger molecule) called Tumor Necrosis Factor alpha (TNF-⍺). This molecule stimulates inflammation, but also promote apoptosis (cell death). These opposing functions help maintain balance in the immune system, and they also play an crucial role in defense against pathogenic organisms such as bacteria. On the other hand, TNF-⍺ is thought to be a causal factor in many chronic inflammatory diseases, such as inflammatory bowel disease (IBD), asthma, and autoimmune diseases, and cancer. 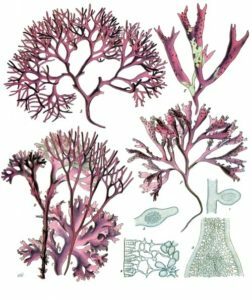 All types of carrageenan stimulate the production of TNF-⍺. Heat, digestive enzymes, acid, and bacteria can convert high weight carrageenans to dangerous poligeenans in the human (and presumably animal) gut. The feline stomach environment is extremely acidic; could this make carrageenan especially dangerous for them compared to humans? Could carrageenan be a factor in IBD, food intolerance, and the skyrocketing rates of cancer and diabetes in cats? Some have pointed out that because carrageenan grows in the ocean, that there is a possibility that it may become contaminated by the radioactivity that continues to spew from the Fukushima nuclear reactor site. Currently, most carrageenan comes from South American countries such as Peru, Chile, and Argentina. Because all of these countries are south of the equator, they are largely protected from the radioactive plume circulating in the northern hemisphere by ocean currents. However, any seaweed products harvested in the north are, now and into the foreseeable future, very likely to be contaminated. In summary, it is clear that the FDA has no interest in all the newer research that suggests carrageenan is seriously problematic. And the other interested parties (including the pet food industry) appear determined to maintain that status quo. However, the USDA removed carrageenan from its list of items allowed to in organic foods, due to safety concerns and consumer pressure. The November 2016 decision will be finalized in 2018, unless manufacturers manage to convince USDA to reverse it (and they are already trying!). It’s up to consumers and pet parents to decide, and to vote with their dollars. It is certain possible that carrageenan could be a factor in many of the health problems experienced by animals and people. It is found in so many products that it would be hard to eliminate, but doing your best to avoid it may be well worth the effort.